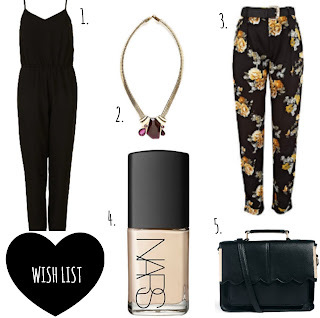 It's coming up to that time of year for me, where I have a ton of birthdays and therefore people to see, places to go and one quick glance at my current clothing confirmed that I need to inject a little glamour into my wardrobe and of course my makeup bag too. 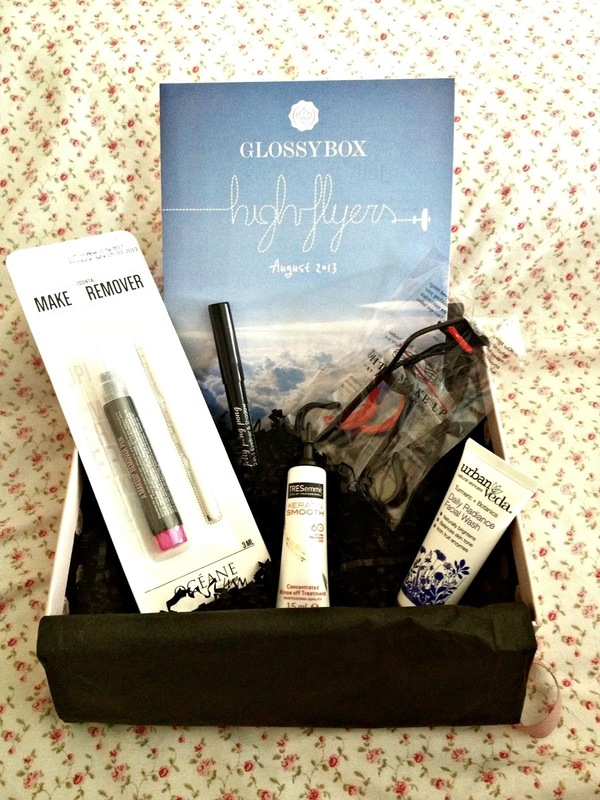 For a while now, Glossybox has been so hit and miss! Some months you love, some you hate! Therefore I am always considering cancelling it and maybe switching to another, however this month I was surprisingly really impressed with my box! I originally subscribed to Glossybox as I wanted to try and discover new products, ones that I may not have heard of or haven't yet had the opportunity to try. 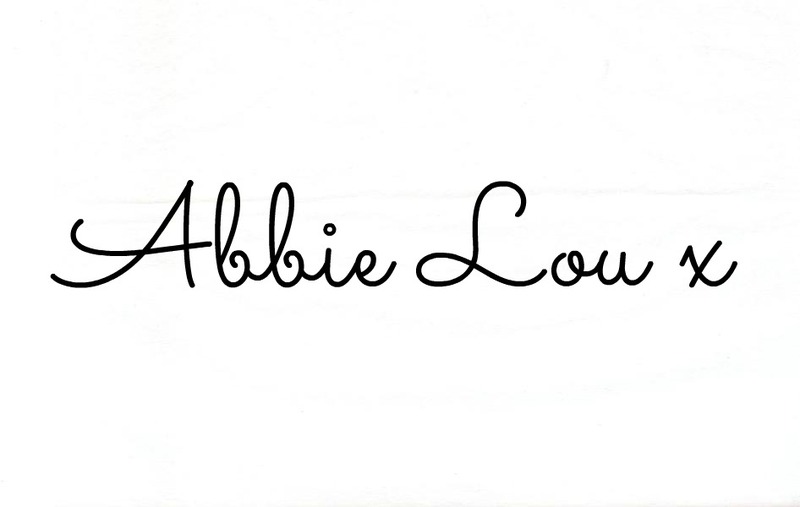 However in recent months there have been lots of products that I have already tried and that are really well known, and although this is sometimes good, I'm usually not too impressed. 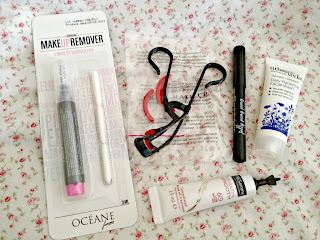 This month there were three brands I'd never heard of and although I had heard of the other two, I'd never used the products that I received, so this really excited me! Best of all, four out of five were full sized products! So this months box is aimed at those travelling during the summer and to coincide with that, includes products from around the world! 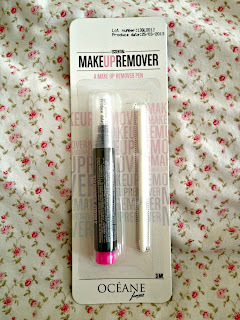 This product aims to be a quick, on the go, makeup remover for any smudges or smears that need to be cleaned up quickly. 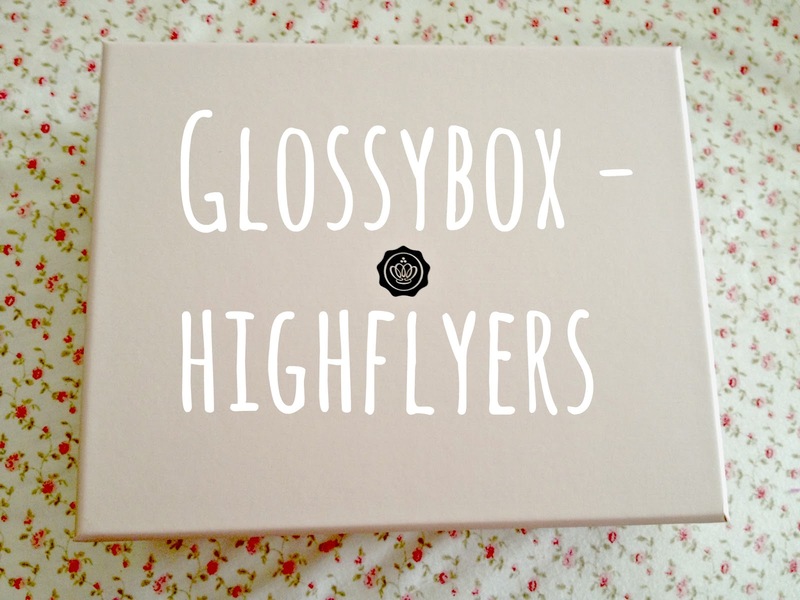 I was so excited when I saw this product, as it is not yet available in the UK, meaning us Glossybox subscribers get a cheeky sneak peek before others, how exciting?! But I have to admit, I was left feeling a little bit disappointed; I thought this would be perfect for smudged eyeliner, but so far I've just smudged it even further when using this. I have only used it a few times, so maybe if I practice with it a little more, I will find that it does actually work well, because although I've not managed to work it with the eyes, it's pretty good at touching up lipstick smudges. So I'd still consider it a handy little accessory to carry in your handbag! 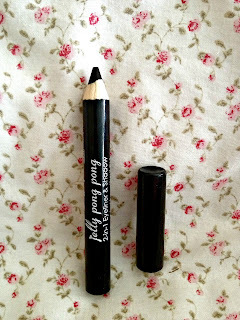 This eyeliner doubles up as a shadow, simply by blending, blending, blending. This is perfect for on the go, and will instantly take you from day to night, just apply eyeliner on the lash line during the day, and work some more into the outer corner of the eye for a night time smokey eye. I have been loving this product since I received it, and it has quickly made it to my everyday makeup routine. A big thumbs up from me! 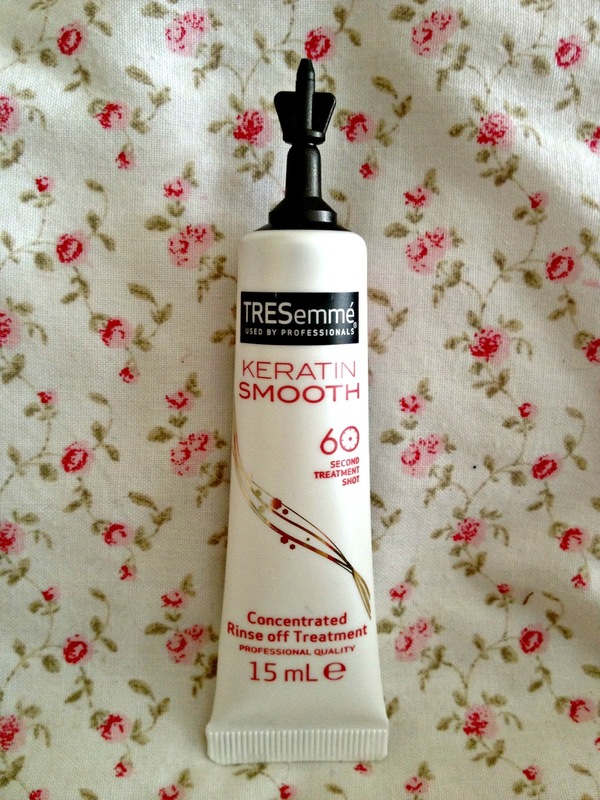 This is a new treatment within the TRESemme range, and aims to restore weather damaged hair. Simply apply once a week after shampooing to damaged areas, leave for 60 seconds and then rinse. This is the only product in the box I have not yet tried out, simply because it's been in my Glossybox since I received it, and not in the bathroom within reach, but I love a good hair product and cannot wait to give it a try. 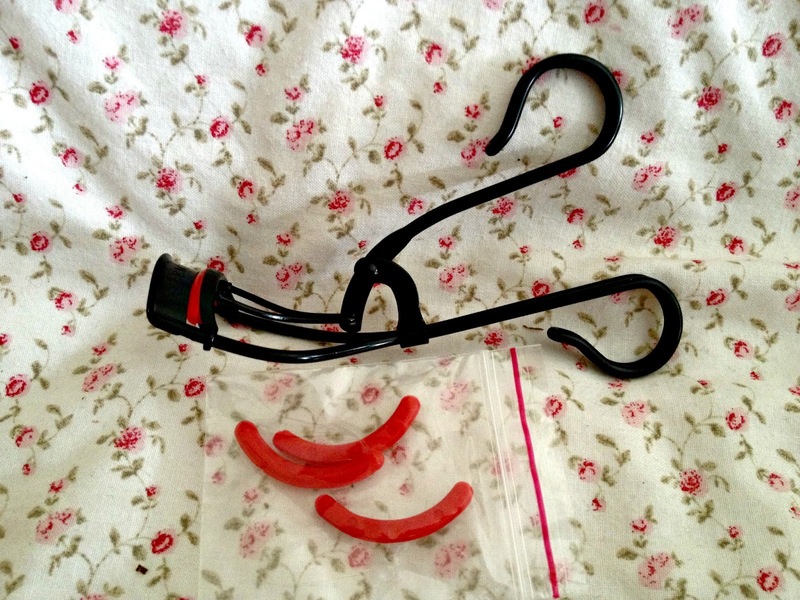 This eyelash curler is designed to suit all eye shapes and without touching the rest of your makeup. I saw a lot of subscribers complaining that these were in the box, however I couldn't have been happier! I had been looking for a good pair of eyelash curlers, and now I have some! These curl eyelashes really well, and although they are firm, they aren't sharp on the edge, like I have found some to be, so there isn't too much damage done if you accidentally get the edge of your eyelid, you know you've done it too! UrbanVeda is a new skincare range on the market, who have taken a holistic approach to taking care of the skin aiming to tackle problems such as environmental damage, naturally. This smells absolutely amazing, however if you get headaches from strong scents, this may not be ideal for you. This product is gentle on the skin and removes makeup with ease, whilst leaving your skin soft and divinely scented afterwards. 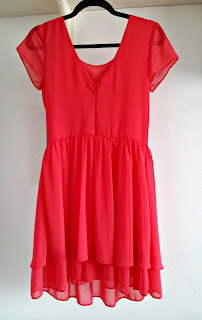 I saw this dress a few weeks back when it was still full price, I instantly fell in love with the dress but I didn't have time to try it on, nor did I really need the dress. 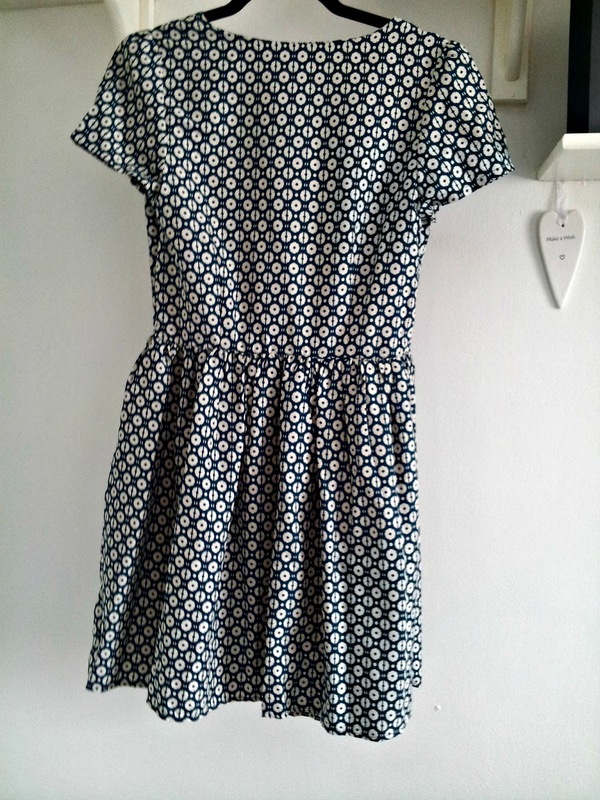 Then a few days ago I was out shopping with my mum, as I realised I didn't have anything to wear to the horse races this weekend and I spotted it in the sale racks at half price, how could I not buy it?! 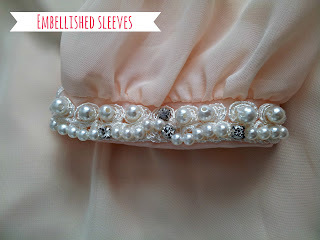 With a little encouragement from my mum I decided to try it on and I fell in love with it a little further which of course led me to the till. 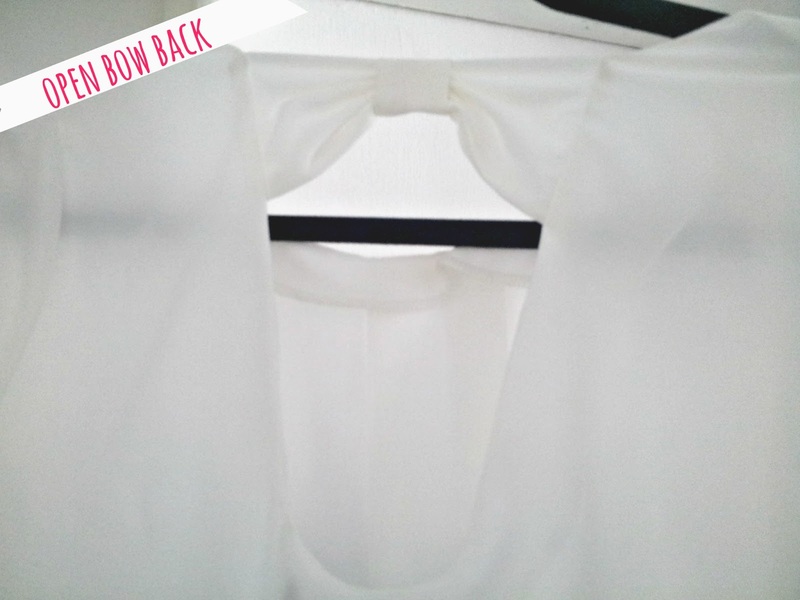 The fit is great, structured at the top with a flowing bottom, perfect for my wide hips. 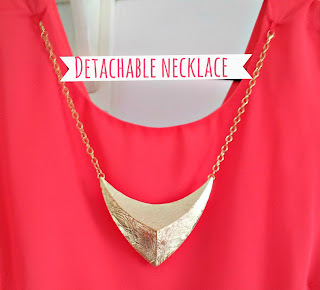 The colour is absolutely gorgeous, it compliments my blonde hair perfectly and best of all the detachable necklace allows it to be more versatile. I have had a love for body con dresses for a while now, and I always admire anyone who has the confidence to wear one. 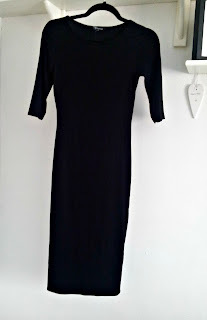 After my recent weight loss I have started to become a little more confident in my clothes and finally gave in to buying this midi dress from Internacionale. 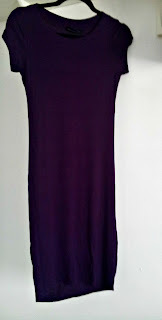 The colour makes the dress versatile and the length, including the sleeves, will ensure that I can wear it right through to winter. I have been pairing this with simple sandals and a handbag recently but aim to pair it with ankle boots and a leather jacket come the chilly months. 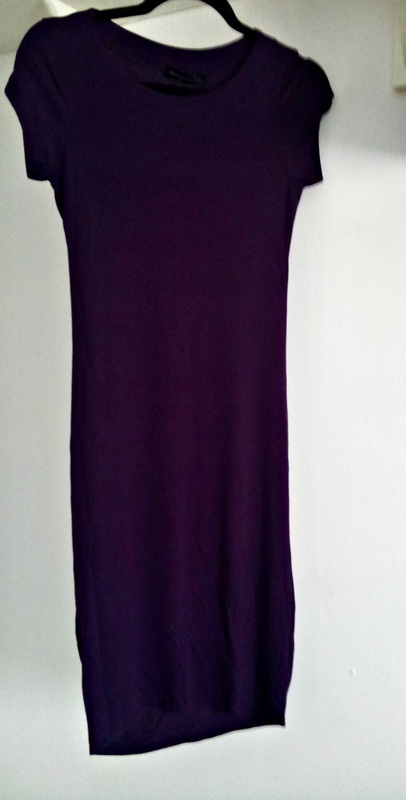 Another bodycon dress but with a slightly different style, the short sleeves allow me to wear this one more on warmer days, while the colour will ensure it still sees me through to autumn.Originally I didn't like this dress when it came, as the picture online looked more of a red toned purple, whereas the colour is actually very purple indeed but for £5.99 there was no point sending it back, and I am actually starting to warm to the colour. The material is quite thin, so I would't advise wearing any outrageous underwear underneath as you will probably be able to see, (unless of course that's your intention) but I just wear plain black underneath and I don't seem to have a problem. 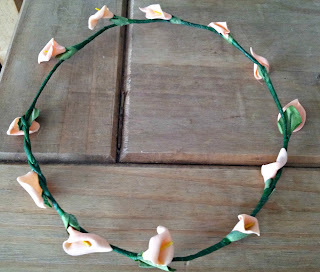 Everywhere I turn, people are wearing floral crowns, but most of them are too daring for me to wear! 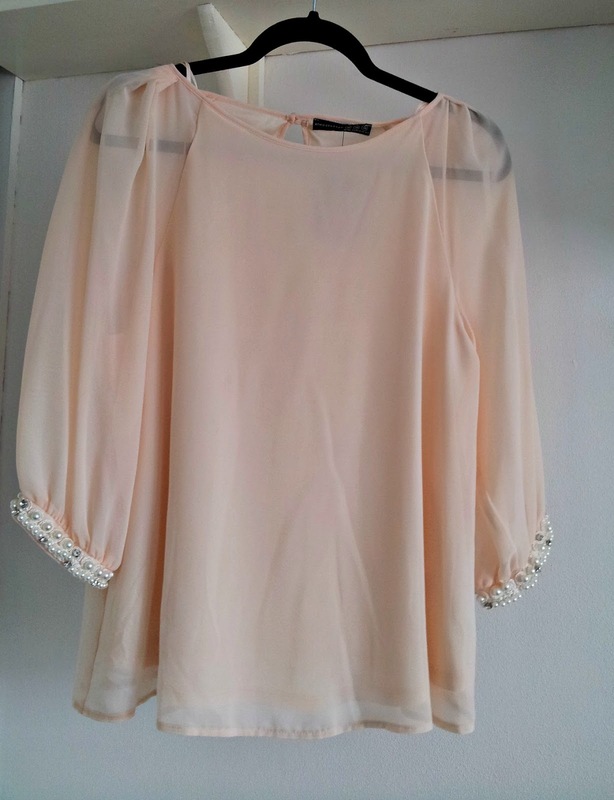 So I was pretty excited to find this one on the Missguided website, as it's a lot more subtle and easier to wear as the flowers are smaller and peach in colour. This went perfect with my white dress which I wore to my engagement party in the picture above, it would also work really well for the summer festivals teamed with wellies, denim shorts, a white t-shirt and a rain coat. 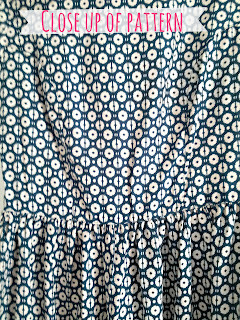 As soon as I saw this tea dress in Primark, I thought it looked so Topshop inspired that I simply couldn't resist it, especially not for the bargainous price of £8! 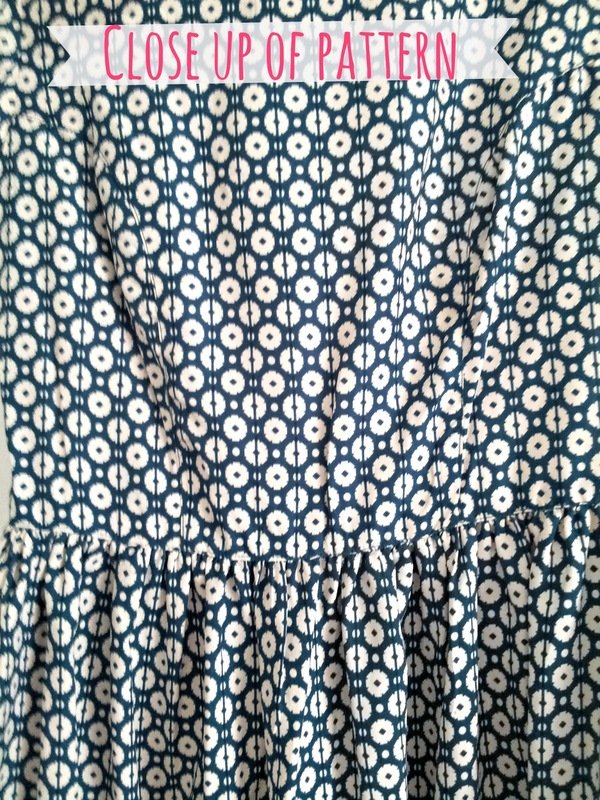 This is structured at the top and floaty on the bottom half, but I would advise going up at least one size, as although their is a side zip, I struggle to lift my arms up in mine as it's a little too structured up top. 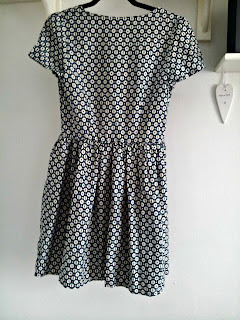 This works perfectly with sandals for summer and would look great teamed with brogues or chelsea boots come A/W. 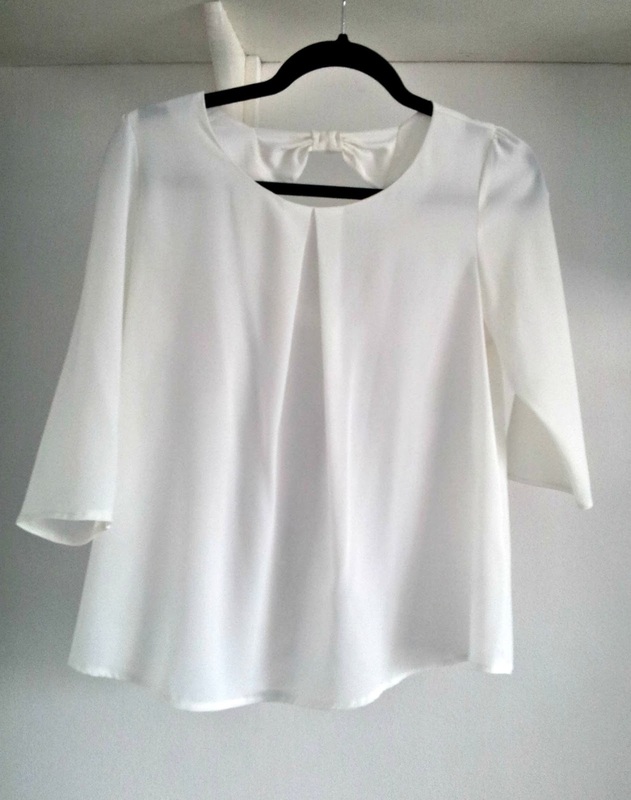 You can't really go wrong with a plain cream blouse, especially not one with a cute open bow back like this one! 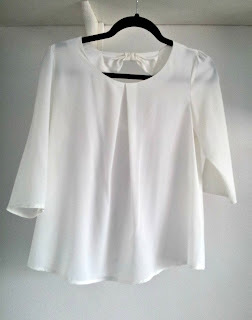 This is a timeless blouse which could be worn in so many ways and for so many different occasions. 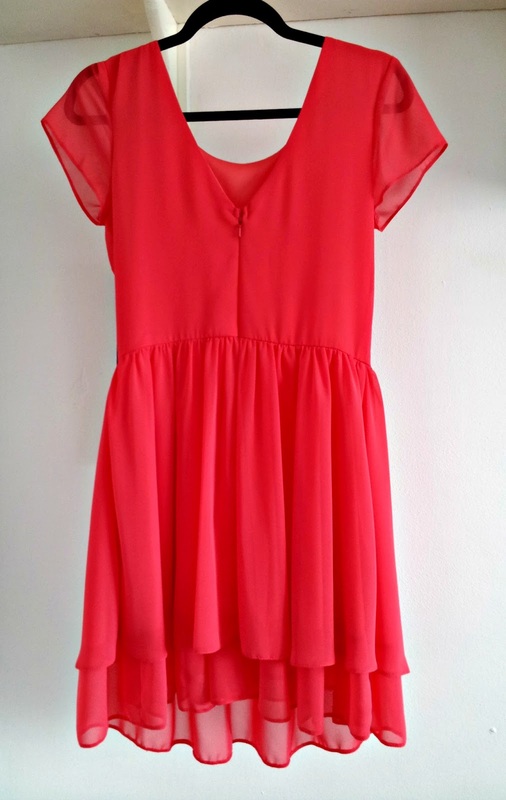 Team it with a pencil skirt for the office, denim shorts for a festival or tailored pajama pants for an evening meal. 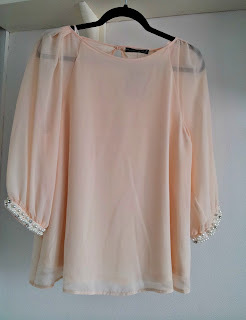 I love the simplicity of this blouse, and how the embellished sleeves add a touch of elegance. 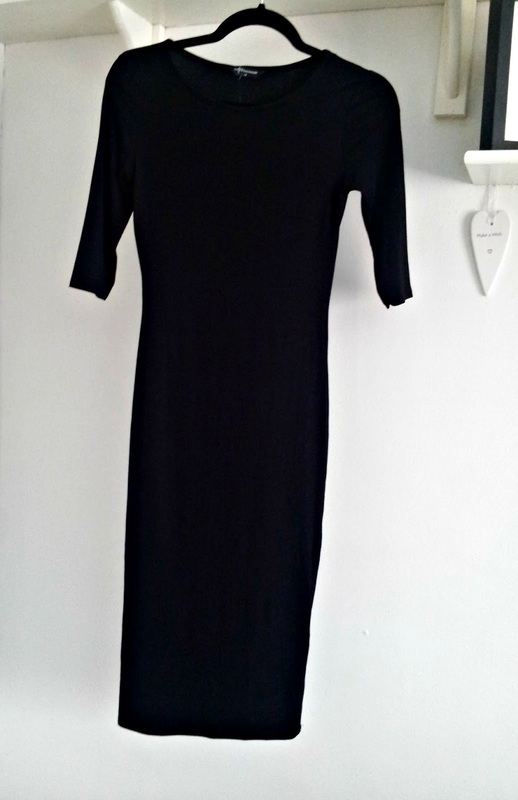 The fit is quite slouchy so is perfect for a day shopping paired with simple skinny jeans, just pop a pair of heels in your bag to put on if you head out for an evening meal on the way home. 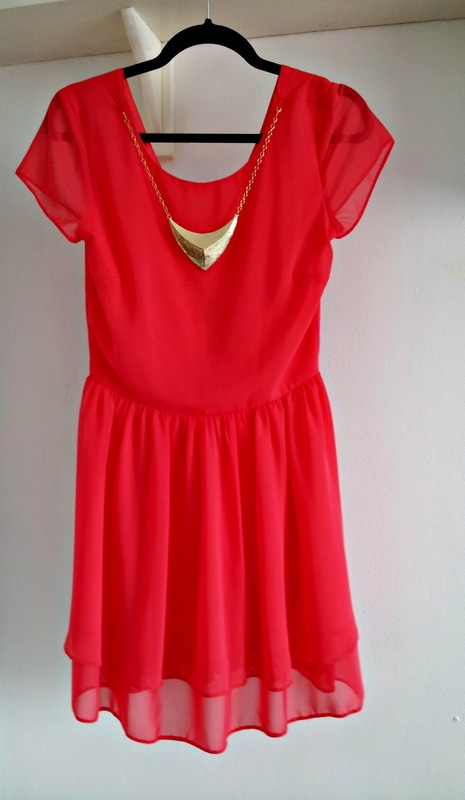 Have you been shopping recently? What did you buy? let me know in the comments section below! The Bourjois Healthy Mix Foundation is a product that crops up a lot within the blogosphere but not one that I have ever particularly considered buying, probably because I already have way too many foundations! And of course you know the drill...*walks into Boots for one product*...*walks out with three* Damn you Boots and your 3 for 2 offers! What I didn't realise about this product before I bought it, was that it's a serum foundation, which I found rather interesting, as I don't think I've come across one before...maybe I've been living under a rock?! 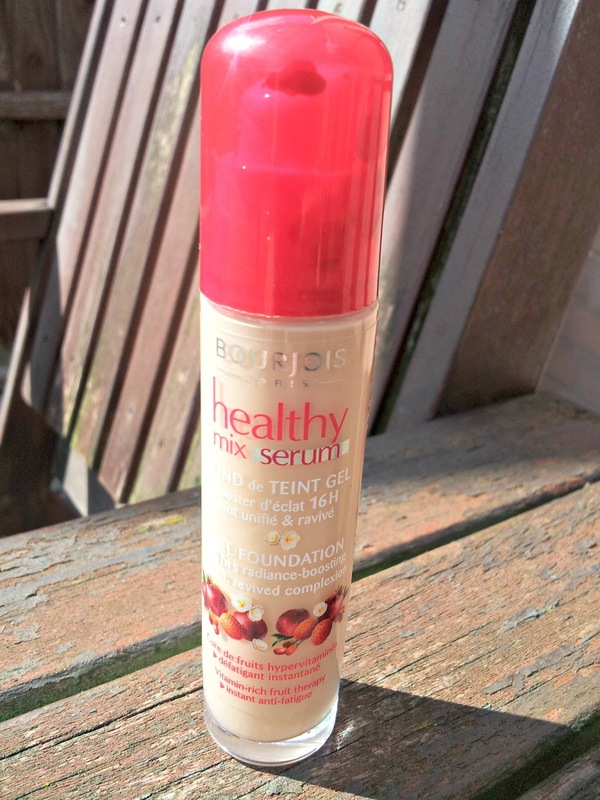 The Bourjois Healthy Mix Foundation boasts to offer sixteen hours worth of radiance boosting, even, revived complexion with vitamin rich fruit therapy of lychee, goji berries and pomegranate for an instant anti-fatigue effect. I have been loving this product ever since I bought it as it gives a light yet buildable coverage, which is perfect for the weather we have been experiencing. 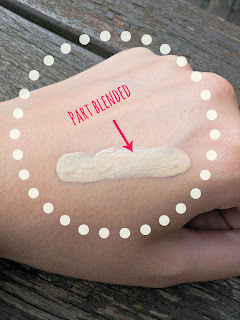 I find that this works best when applied with my real techniques buffing brush, as it helps to achieve an all over even base which blends really well and gives a glowing effect to the skin. 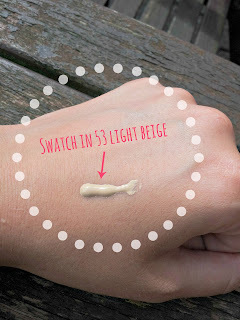 I purchased this in the shade 53 light Beige and this is the perfect shade as it's light enough, without being too pale for my olive toned skin. 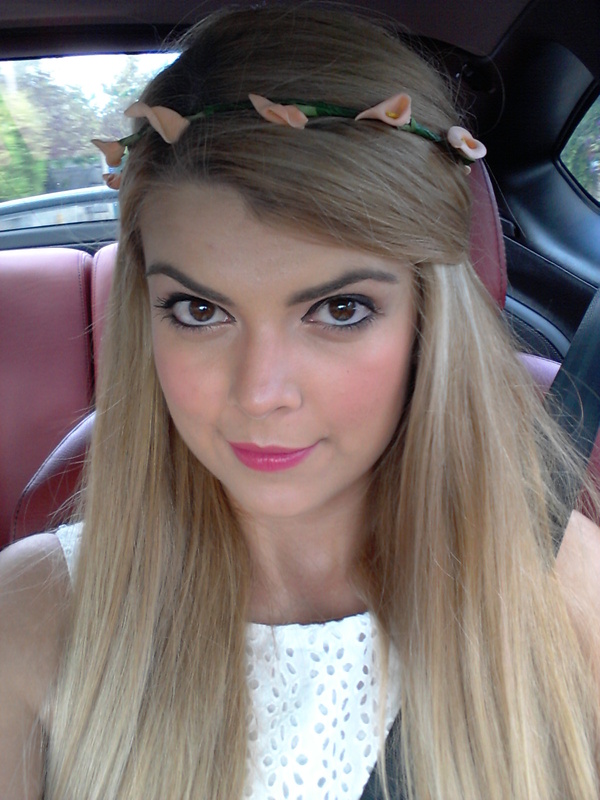 For everyday wear I apply one layer of this foundation and if I'm going out I will usually build them and wear two. 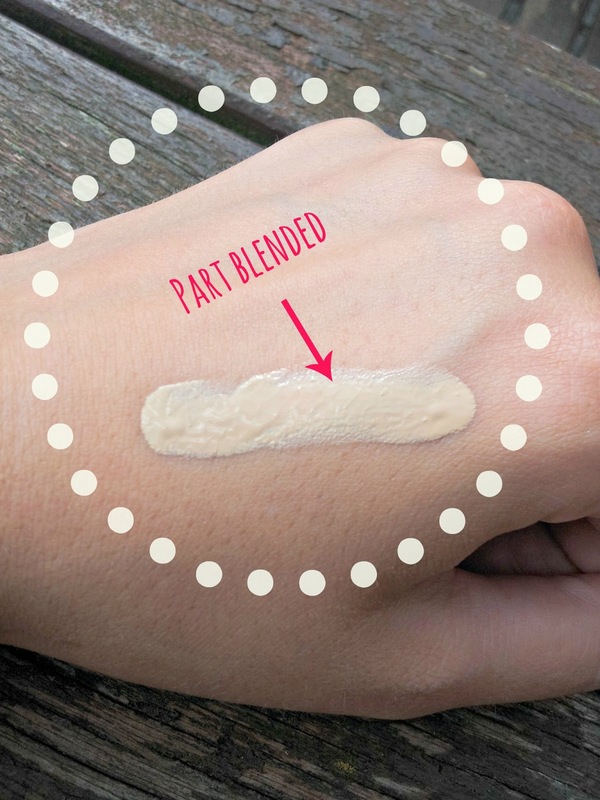 One layer works really well with this foundation for everyday wear but two just ensures that any blemishes are covered for that little bit longer. I love that this foundation doesn't actually feel like your wearing any, it never feels heavy or cakey and instead feels smooth and silky, similar to applying a moisturiser or face serum, which I guess is the whole point. It instantly wakes up a tired looking face, looks flawless and best of all, like all Bourjois products, it smells pretty good too! 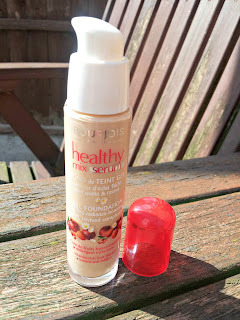 Have you tried this foundation or any others by Bourjois? Let me know your thoughts in the comments below. Just a glorified can of water? or a multipurpose skin saviour? There are so many facial mists around at the moment, that I didn't know which one to choose, I knew that I wanted to try the product, but when my fiance had been referring to them as a 'can of glorified water' (yes he thinks he knows best,) I couldn't help but feel they were all rather a little expensive for what they were. 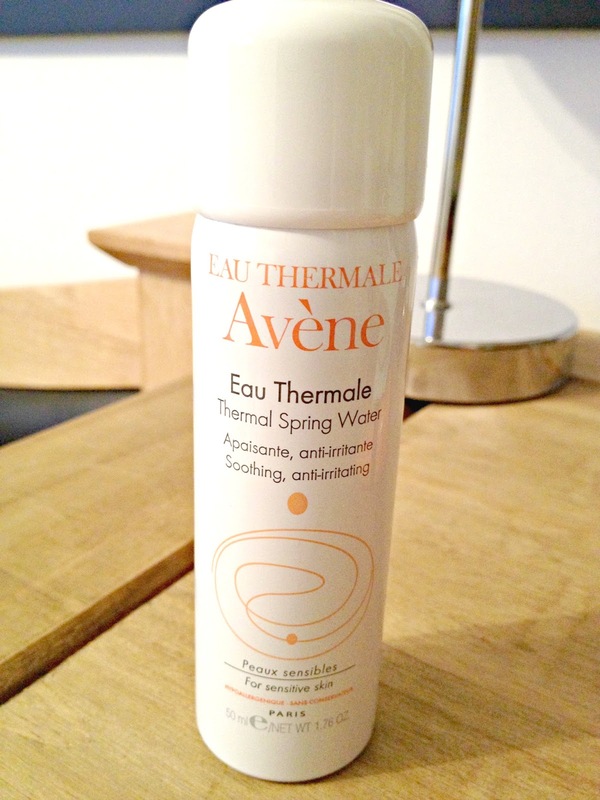 Then I came across Avene's Eau Thermale Thermal Water Spray in a cute 50ml bottle in Boots, and at only £3.15 (which you can purchase here,) I didn't think I could grumble, as most are at least double that, and miles too big. This product came with a leaflet, but give me paper and it disappears, in a skittles advert kind of way, so I'm just going by the bottle here - This product is 'tested by dermatologists' and 'is a key element for sensitive, hypersensitive and allergic skin.' It acts as a multipurpose product which can be used for many skin situations such as skin irritation, razor burn, sun burn, to set make up and even diaper rash for you mummy's out there. 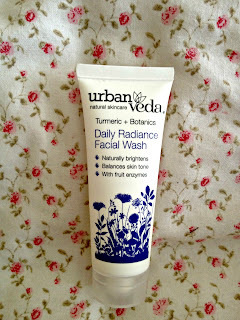 So all in all this product aims to be used in a variety of situations to help soothe skin. I must admit, that when I first got this product, I sprayed it on my face, (a tad too close,) ended up with a pretty wet face, and was left feeling rather miffed about it, so in my handbag it went, pretty much unloved. Then around a week later, I was in the car with Dan and I noticed that my skin was peeling rather a lot, we were on our way out for a meal, so this bothered me, as I hate to see dry and flaking skin, and I had clearly forgotten to moisturise. So I took the water out of my bag, in the hope that it would do something, I sprayed it onto the area, and left it to dry, then a few minutes later Dan turned around and said that my skin wasn't peeling anymore, it seemed to have put back the moisture in my skin and he was so impressed that he made me spray him too. Now we are always reaching for this little can of 'glorified water' as it has become a constant savior, when we are out in the car on a hot day, I always spray a fine mist, far away, (I've learnt my lesson) onto our faces, and it instantly cools us down. We also use it at home, like if Dan has cut himself shaving or I have burnt my hand on the straighteners, (yep were a right pair,) then spraying this on instantly soothes the skin. So neither of us think of it as just a can of 'glorified water' anymore, as we both reach for it on a daily basis, and although I'm sure you'll all still have your suspicions, please try it before making up your mind, I would go as far as to say it is a real handbag savior. Have you tried any of the facial mists yet? what did you think?